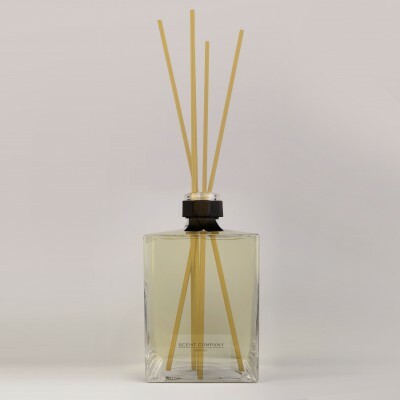 The antique inspired apothecary room diffuser comes with a bunch of rattan sticks for a continuous dispersion of the scent in the branded environment. Besides granting an effective scenting, it represents a real home, hotel, SPA or retail store’s décor element and allows to extend the olfactory branding project inside smaller branded spaces, without the use of professional high-tech fragrance machines. It is the perfect choice for the home living areas, hotel lobbies, bathrooms and corridors, entrances and private areas of retail stores and relaxation areas of SPAs. The best way to choose the right size of the glass bottle is to start identifying the area size of the space you want to scent. The 2500 ml or 5000 ml capacities are suitable for ambiances usually larger than 15 sqm. For larger ambiances, it is recommended to have two Magnifica room diffusers in the opposite corners of the area.